Fancy playing table and card games just like they do in land-based casinos without the hassles of physically visiting one? Thanks to technology you don’t have to move an inch to achieve this right from the comfort of home. Top 10 Casino Websites features the best live dealer casinos that offer a unique experience where all you do is relax and let technology do all the work. Our team of experts has pulled out all the stops to bring to you the best live dealer casinos that offer a real world gambling experience. If you are game for a unique experience, and of course, the thrills of a land-based casino, then Top 10 Casino Websites is where you can get started. Live dealer casinos are one of the greatest innovations in the online gambling industry with leading software providers of the likes of Microgaming, Evolution Gaming, Playtech, and Net Entertainment, leading the pack. The games are streamed live from the gaming provider’s studio and are conducted in an authentic casino setting with a real dealer or croupier conducting play rather than software. Some games are streamed live from a land-based casino. You get to interact with the dealer and other players and bet just like you would at a casino. If you play Blackjack the dealer will deal out the cards to you while if you are playing Roulette the croupier will spin the wheel. Simply choose your bet type and amount and let the dealer do the rest. You will be able to add or remove chips or sit out, depending on the table you play. You can play and watch the game unfold on the interface. What’s even better is the fact that you can play multiple games at a time in the formats available. Game-play is smooth, fast and seamless, so get set for some high octane action at live dealer casinos. Once you have deposited funds in your casino account you can head over to the casino’s live dealer section instantly. 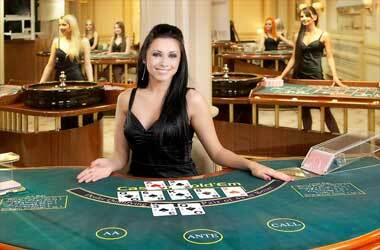 Waiting for you are dealers or croupiers who regulate both single and multi-player games. The Live Dealer Interface usually features two viewing modes. Game View: In this view the video feed is smaller and you will be able to see it at the top of the screen along with a dashboard featuring history, game stats, and dealer information on either side. The betting interface is at the bottom of the feed where you can change your betting amount. Casino View: The video stream covers the screen with a full view of the table layout and dealer. The history, game stats, and dealer information are located on the left and right corners of the screen. Both views have betting layouts that are simple to operate. Players usually have 10 to 15 seconds to place bets in blackjack, baccarat and Casino Holde’m and around 40 seconds to place wagers in roulette. Some casinos allow you to play several games simultaneously. Our experts at Top 10 Casino Websites recommend that you play at a live dealer casino at least once to explore a whole lot of benefits as compared to regular gaming. 1. Where can I find the best live dealer casino games? You really don’t have to look further than Top 10 Casino Websites. Right HERE you will find some of the best live dealer casinos there are in the business today. In addition, at most online casinos there will be a link to the Live Dealer section on the home page. 2. What are the popular live dealer games? Currently, live dealer Blackjack and live dealer Roulette are the most frequently played games. They are easy to learn while game-play too is simple. The house edge in both games are also smaller. Other games include baccarat, Casino Hold ‘em, and 3 Card Poker. 3. How much do I have to bet at live dealer casinos? The maximum and minimum bets vary although Blackjack games usually have a minimum bet of $25 and maximum of $500 per hand. Minimum straight up bets in roulette begin from $0.50 to $10. However, there are much higher betting limits to cater to high rollers. The minimum bet in Baccarat is generally $10 and can go up to $500 per hand. Minimum bets in poker games begin from $1 up to $2,500 or more. 4. How do I join a table? Once your casino account has enough funds you can simply enter the casino’s live dealer section, click on the desired table and the place your wager. 5. Are live dealer games available on mobile devices? Yes, there are some casinos that feature live dealer games compatible with a range of smart-phones and tablets including Apple and Android. 6. What type of internet connection do I need? A reasonably fast internet connection such as broadband or a 4G connection if you want to play on your mobile device is sufficient to enjoy live dealer games. 7. Do I have to download any software? This depends on the casino. Some casinos allow you to play directly in a compatible browser while some may mandate that you download a software client. 8. What if my internet fails during play? Casinos have their own disconnection policy so make sure to read the terms and conditions or contact customer support prior to playing. In most cases, your balance which includes what you won or lost will be reflected in your account once the connection is back.